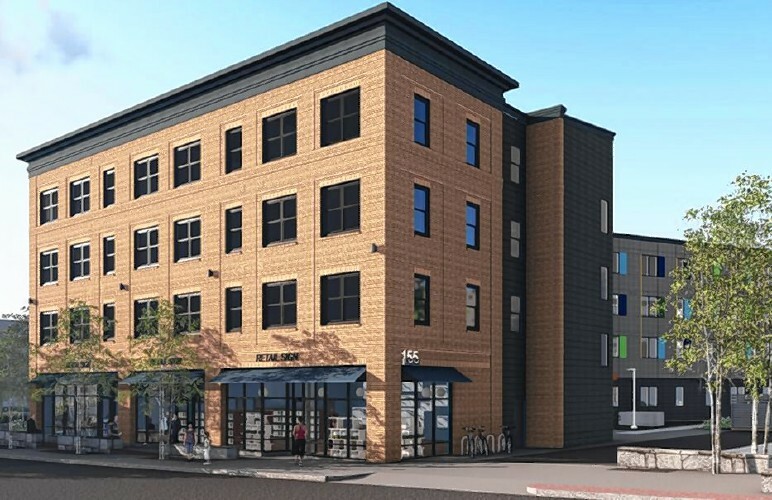 Live 155, a multifamily affordable housing project in Northampton, Massachusetts recently chose to install a commercial-scale, ductless mini-split system to heat and cool the 70 residential units in the 58,000 square foot building. The units, a combination of 1-bedroom and studio apartments, are each outfitted with single-head ductless mini-split heat pumps thanks in part to a $105,000 rebate that the developer, Way Finders, received from the Massachusetts Clean Energy Center. This rebate is the largest single award that the MassCEC has granted to a project leveraging air-source heat pumps for clean heating and cooling. The rebate that Live 155 received proved to be crucial to the installation of the heating and cooling system, which cost $247,960. Live 155 leases its units strictly to tenants with moderate, low, or extremely low incomes. Way Finders chose to utilize air source heat pumps for the heating and cooling of the Live 155 complex as an alternative to natural gas, which is not available in the area. Additionally, they knew that the money that the building would save in the long term by heating and cooling this way made air-source heat pumps the right choice for this project. Since the most efficient air-source heat pumps use 40 to 70 percent less electricity than traditional heating systems, Way Finders knew that installing this type of system in their building would make the project much more energy efficient. The building also features a 100 kilowatt rooftop solar PV system, which will support the electricity demand in the building. Peter A. Gagliardi, President and Chief Operating Officer of Way Finders, highlighted the many reasons that air-source heat pumps were the right choice for this project, “Way Finders is proud of the Live 155 building design by PFRA+LDa and the construction work by Western Builders and its electrical sub-contractor MJ Moran. Heating and cooling Live 155 apartments with mini-splits offers a great combination of energy efficiency, reasonable operating costs, and a high degree of resident comfort.” We are proud to have contributed to this project through our Commercial-Scale Air-Source Heat Pump Program and look forward to supporting similar projects in the future in order to give as many Massachusetts residents access to clean heating and cooling technologies as possible.